The rest of the lineup had been revealed! We'll be showing episodes of Heroman, which the late Stan Lee was involved with in the production, and even has a cameo! And we'll be showing a couple random episodes of Cromartie High School, because we need to end 2018 right. Anime Nite Orlando is a dinner theater-inspired event that showcases the best in Japanese animation. 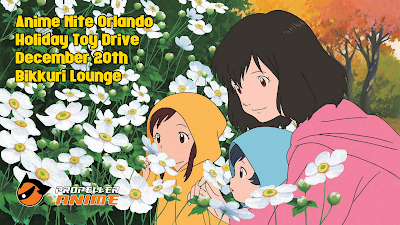 Propeller Anime hosts this event every month at at Bikkuri Lounge, located at 1919 E. Colonial Dr. Orlando, FL. This event is free and doors open at 7:30pm! You must be over 18 years of age with a valid I.D. to enter. Bikkuri Lounge is an anime fan's paradise with the best in Japanese cuisine including sushi and sake, and a full bar with drink specials such as $6-for-2 beers and $4.00 wells until close!